The recent snow storm brought out everyone’s sense of adventure from skiing down the streets in Beacon Hill to binging shows on Netflix while sitting comfortably on the couch. Whatever your level of engagement with the cold, we know it’s time to climb and what better way than with the Adventure Programming workshop being offered indoor at the Kroc Corps Community Center in Boston. A couple of months ago, our Youth and College Programs staff visited the Kroc Center to take inventory of the high elements installed and prepare them for use with Open Enrollment workshops and school programming. 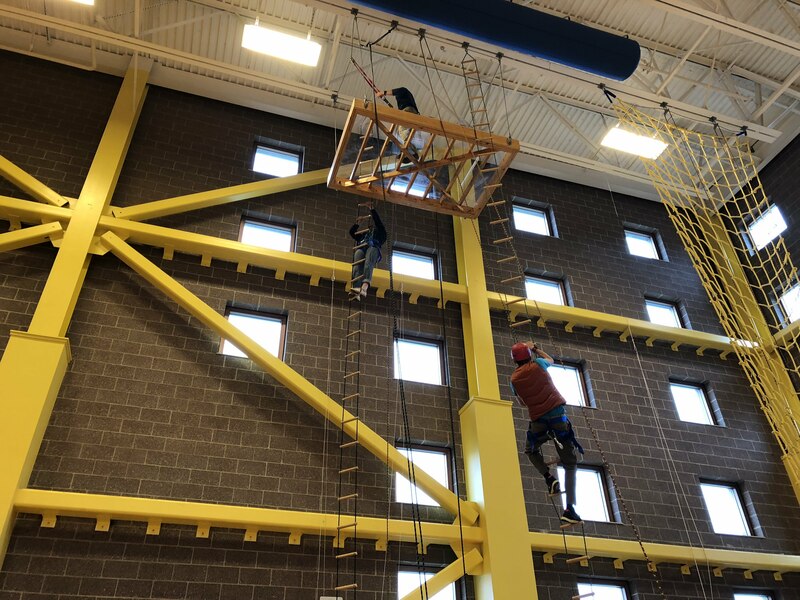 One of the elements, the Space Station, a platform with a view of the Boston skyline from the gymnasium window, allows future participants the challenge of climbing to the top and then self-rappelling back to the gym floor. Another, less visible element, is the Flying Squirrel. Taking part in this activity will give you the feeling you’re flying as your team safely pulls you to height. These experiences were ones that we could only offer outdoors or at your site, but now that we’ve partnered with the Kroc Center, we hope to engage more members of the surrounding communities with these experience as time goes on and our partnership strengthens. We have quite a few workshops scheduled to take place at this incredible facility. Our first is Adventure Programming on January 22-25 and Social and Emotional Learning through Adventure on January 25-26. These are great opportunities to bring new energy to your school or organization during a time when staying indoors is your only option. Click here for more information and to register for these workshops. Copyright © 2016 Project Adventure, Inc. – A Non-Profit 501(c)3 Organization. All Rights Reserved. Website Design © Artfluence.